If you are ever called into an interview meeting with your supervisor or manager so that they can investigate a situation which might result in discipline, you have specific representational rights. These rights are called Weingarten Rights and they are summarized below. This statement could save your job! "If this discussion could in any way lead to my being disciplined or terminated I respectfully request that my steward be present at the meeting. Without representation present, I choose not to respond to any questions or statements." You have the right to have a Union steward or union representative present. If you want a steward there, you must ask for him or her. If you do not know why your manager wants to meet with you, ask him/her if it is a meeting that could result in a discipline. If your manager refuses to allow you to bring a steward, repeat your request in front of a witness. Do not refuse to attend the meeting, but do not answer any questions either. Take notes. Once the meeting is over call your steward at once. You have the right to speak privately with your steward before the meeting and during the meeting. Your steward has the right to play an active role in the meeting. She or he is not just witness. 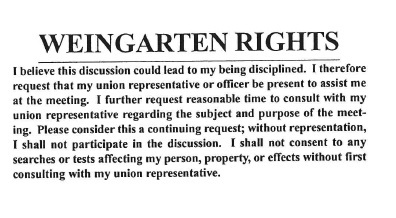 These Weingarten Rights are based on a 1975 Supreme Court decision (NLRB vs. J. Weingarten). As with all rights, if we do not use them we lose them. You must make a clear request for union representation before or during the interview. You cannot be punished for making this request. Give you a choice of (a) having the interview without your union rep or (b) ending the interview. If your manager or supervisor denies your request for union representation and continues to ask you questions, he or she is committing an unfair labor practice and you have a right to refuse to answer. Your manager or supervisor may not discipline you for such a refusal. To order Weingarten Rights cards for your local please contact Mary Sheehan, msheehan@nage.org in the NAGE Membership Department.